Up to five Prizes are bestowed each year to individuals or entities (games, clubs, or organizations) that (1) exemplify service, quality, and dedication within the play-by-post online role-playing; or who (2) pioneer new technology or techniques within the community. The Prizes can recognize a significant onetime accomplishment, or sustained contributions over a period of time. Individuals and entities that win a prize are entitled to use the honorific Simming Prize Laureate. Officially known as the The Prize for Simming and Online Role Playing in Memory of Seth Cotis, the Simming Prize honors the memory of Seth Cotis, founder of the Starfleet Legacy Alliance and a long-time leader within the Simming League. The Simming Prize was established by the Simming League and first awarded in 1999. Initially, Prizes were awarded in five categories - Internet Technology, Literature, Management, Peace, and Service. These categories were discarded in 2007, and since that time the Simming Prize has been issued without a category. 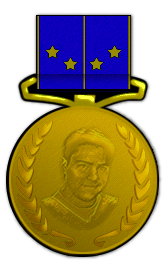 Following the death of Seth Cotis in 2005, the Simming League proposed to establish a Seth Cotis Medal of Honor in his memory. Ultimately, the already established Simming Prize was instead renamed in his honor. After the Simming League ceased operations, responsibility for the Simming Prize was transferred to Ongoing Worlds in 2011, and to SimEnc in 2012. In 2014, responsibility for the Simming Prize was entrusted to a group of trustees. The Prizes are now issued in the name of the trustees and are no longer associated with a larger organization. Nominations may be submitted by the public at any time during the year. For his dedicated service to UFOP:SB 118. From welcoming new members to the club, to facilitating a fleet wide story arc, to serving on the podcast and publicity team, to rewriting the archive script that preserves the clubs sims - Nugra has repeatedly taken on the unsung roles that contribute to the unique vitality of UFOP:SB 118. For it's long history of providing quality simming within a stable environment. Since 1994, the UCIP has taken a pragmatic approach to management - most recently manifest by reaching outside its ranks for its new leader - an approach that has been instrumental in sustaining the club's collaborative & friendly community. YSS Kaiyo II of Star Army For its excellent & sustained high quality simming. Set in an unique member created universe, the GM puts ample time into crafting a well though out story, and the players breath life into their characters, making them individuals, not archetypes. The writing is at times funny, at times sad - but it's always clear the GM and players enjoy the universe they have created and together get to explore. For his unprecedented contributions to the simming community. As a founder and long time leader within Independence Fleet, Charles has personally sponsored the launch of 21 sims and commanded 10 within the club. During his time as IDF CinC in the early 2000s and as Chief of Fleet Ops from 2010 - 12 he oversaw exceptional growth within the club. More recently, Charles has been a primary a leader within the larger simming community, serving as the administrator/coordinator for SciWorld, FallFest, the Tournament of Simulations, and the Squiddie and OWCH awards. He is a member of the OngoingWorlds Board of Advisers, and has been the instigator of community wide April Fools jokes. Charles is also a storehouse of simming knowledge, and has been a primary contributor to the Roleplay Wiki and the OngoingWorlds Blog. For her exemplary work as a storyteller and community builder. Kristen is the driving force within SPCsimms. With skill and good humor, she serves as a mentor to new members and is an invaluable aid to hosts and club leaders. As a game master and player, her imagination underpins multiple sims. Kristen is relied upon to smooth difficult situations, polish posts, and inspire those around her to push their writing to the next level. Most recently, Kristen was instrumental in rebuilding the Kepler Station sim after the untimely death of its longtime host. Kristen's service and dedication stands as a model example of the ideal community builder and simmer. For its history, longevity, and current community. Founded on the Prodigy online service in 1991, STF is the oldest Star Trek sim club in existence. It has been able to persevere through a quarter century of technological change and simming political upheaval. To this day, STF remains a vibrant club with a dedicated core of members who forge new adventures while preserving the club's traditions and unique simming style. For her dedication to the Stargate simming community. Teresa offered her time and skill to help fellow leaders build their websites, and she ran the stargaterpgs.com portal as a community resource to advertise available Stargate games. As a game master, she was the guiding force within the Stargate Ancient Legacy sim club, steering the group's story arc, playing numerous PCs and NPCs, and making sure each team advanced the story in an inclusive fashion. For its excellent storytelling and remarkable history. Over two decades of existence, the Vindicator has sailed the Star Trek universe. It's latest captain and crew spin adventures full of villains, fantastical species, and new technologies. The depth and quality of its writing today stands as one the finest examples in the Star Trek simming community. Bravo Fleet For setting the gold standard for quality and success within the simming community. Few can match the longevity of Bravo Fleet. No one can match the growth and evolution the club has experienced. Bravo Fleet has been able to adapt to multiple shifts within simming, and find success with each new generation. Through its ups and downs, it has developed a robust community and self governing system; and one that is able to learn from the past, correct mistakes, and reform around new realities. The Original Marvel Roleplay For it's long standing community and gaming quality. The Original Marvel Roleplay has been a fixture within Second Life since 2007. It is, first and foremost, a top destination for individuals who want to play their favorite superheroes. But more than that, it's a community. People are encouraged to engage in social RP or create their own events at the many spots available throughout the multi-level region. They also allow created characters, offer classes for student characters, and host a number of fun gatherings throughout the year. Even though the members of the leadership have changed and the region called home has moved several times over the years, it is a real testament to the overall community that it has remained strong and open to players of all stripes. For being a valuable recruiting resource. The dedication of PBEM2.com to run and maintain the site for the benefit of all sims and clubs is to be commended and represents the highest example of service to the simming community. For its high quality sims, which stand as one of the finest examples of Star Trek simming in today's community. The episodes of the USS Galileo frame a fresh but faithful perspective on the historical Star Trek franchise. The posts are well written and prolific. The individual qualities of each character shine through, as each person works to carry out their duty. The website is elegant, filled with ample detail about the ship and crew. It's evident the members of the crew have put serious thought and time into carving out a home on the Galileo. The Gamemaster of Ongoing Worlds For the high quality writing and imaginative posts contributed to multiple games across Ongoing Worlds. For the unparalleled dedication and resources it provides the online role-playing community. Through the selfless dedication of its gamers, staff, and contributors, Ongoing Worlds has become a home to hundreds of games, and stands as a trusted, central hub for all online role-players, regardless of affiliation. For it's compilation of images and graphic assistance it offers to the online role-playing community. With its images, Sci-Fi Avatars has enlivened an untold number of websites and message boards. For it's long standing quality and success, in which two decades of simmers have sustained a creative energy and continue to generate a universe whose imagination and depth is without equal in the Star Trek simming community. David Ball of Ongoing Worlds For his devotion to the craft of role-play, his many contributions to the larger online role-play community, and his efforts in maintaining the Ongoing Worlds roleplaying community and Ongoing World Blog, which services the greater community. FSF Radio 2 For its enchantment and groundbreaking innovation of broadcasting the lives, stories, and other humanistic qualities which continue to make simming and online role-play an enjoyable hobby for many. Star Army For its fantastic, interesting concept and design, its unique, inspiring setting, and its active, helpful community that welcomes new players openly. Trek Simming Podcast For its groundbreaking innovation that has created informative radio, honored simming and online role-play culture, and its path of reaching out to the larger simming community. Vault 713 For its consistent excellence and devotion to creating and exploring uncharted worlds in a compelling narrative, and for their exploration of a classic literary tale. For creating and supporting the NOVA RPG management software. Easy to manage and update, NOVA has become a backbone of today's play by post community. NOVA allows crew members to update their character bio, send private messages, and write joint posts with fellow simmers; it allows sim hosts to send out announcements, approve applications, and create NPCs. An invaluable auto-logging feature provides seamless archiving of posts, mission logs, and personal logs. For his years of service as the webhost of Bravo Fleet and Ninth Fleet, as well as for a number of individual sims within both groups. Despite the challenges of maintaining two large sites for clubs that have sometimes been at odds, Darian has kept a neutral bearing and has gone above and beyond to make sure the servers are online and updated, and that the sites are up and running. For his community development work within UFOP: StarBase 118. In addition to having earned a reputation as a captain who ensures his crew members are engaged in the sim, Ed has become a cornerstone of the club's community. He is active with the UFOP: SB 118's academy training program, where he helps teach new simmers. For two years running, he has been the creative force behind the club's "summer blockbuster" fleet-wide plot arc, developing the overall story arc and writing mission briefings for each ship. Ed has also facilitated the club's "Writing Challenge" judge's team and was the leading force behind UFOP: SB 118's "Writing Improvement Month." For their quiet service as linchpins of the Starfleet Legacy Alliance. Between them, Kerrigan and Black served on over a dozen sims during their storied careers. With his sims, Kerrigan always managed to put a smile on the face of others, and Black's cheeky stories delighted, in the process dragging a plot out of crises and into mayhem. Both were friends and mentors to countless individuals within the club. Once earned, Black's loyalty was incredible. Kerrigan provided a caring ear and unabashed advise. As the Recruiting Chair, Kerrigan was able to re-energize sims by providing new members and hosts. Black's only desire was to write, but when needed he would step up and serve as second in command, and on one occasion was found to be in command of a sim. For its rich, dedicated community. Simming continuously since 1995, Starbase 400 has developed a vast backstory, complete with two dozen permanent NPCs, a fleet of ships, and a dangerous intersection of space to defend. To support its in character universe, Starbase 400 maintains an academy, a database, a timeline of sim canon, and logs of each mission to ensure members are informed. Infused with a focus on character development and realistic storytelling, these factors combine, producing an intensely vibrant sim. For her creative use of social media to support a small, thriving role-playing game set during the Golden Age of Piracy. For its outstanding efforts to facilitate community; internally fielding a wiki, newsletter, and group chats; and externally hosting the SciWorld Online Convention, organizing Fall Fest, and pulling the Super Space Command 3000 April Fools' Day joke. For his exemplary leadership within the simming community. Having founded or nurtured clubs as diverse as Tango Fleet, Bravo Fleet, and now The Ninth Fleet, Mike stands as one of the most successful and influential figures in the history of simming. For its innovative mix of MUSH and role-playing to create a dynamic, engrossing gaming environment. For its exemplary community, which for over 15 years has consistently offered detailed, high quality sims, and a welcoming, friendly gaming environment. For her innovative command style, through which she fosters crew dedication and creativity by breaking the traditional molds of simming. Her sims, most recently the USS Avalon, follow no set pattern, with missions that run from the serious to the comical, and which can be tightly controlled with a sim master or run free though a collaborative crew effort. For her decades of exemplary service to the simming community. Beginning as a host in Spacefleet Online, through her service as the leader of the Continuum Online and publisher of the Communique Online, and to the present day, Tigra is a fount of wisdom and fairness, and has been a friend and mentor to generations of simmers. For its energetic, engaging sims. Through its many incarnations, the Sunfire has attracted raw simmers and molded them into future leaders, sending out over a dozen simming hosts from its ranks. Its open approach to membership, which welcomes simmers of all ages, interests, and writing styles, gives rise to a diverse crew, who, feeling welcome, produce hundreds of posts a month. This openness has been emulated across Independence Fleet, helping spark a renaissance within the club. For his distinguished work, founding Ajje Games in 2005, serving as its president until 2009, and establishing Ajje Games as a leading member of the simming and online role-playing community. For serving as Commander in Chief of Sixth Fleet and leading the group out of stagnation by revamping its organization and improving recruiting efforts. For his exemplary skills as a simming host, devoting countless time and energy to his crew, and in service to the UCIP. For utilizing an open approach to simming, welcoming new members and visitors alike to join in the mission, giving rise to numerous memorable, engaging storylines and steadily growing attendance. For her prolific simming skills that have established her sim, the USS Lionheart, as one of the best, and for her endless spirit, making her a cornerstone of the SLA, providing care and advise to those in need. For her dedication to the Simming League, including her two years serving as its President. For his pioneering work exploring the educational value of role-playing through his group, NewWorldsRPG. For his outstanding service to the Simming League and the Federation Sim Fleet. Jay has long been the invisible man behind the scenes who make sure things get done. For their efforts to stabilize and transform their sim club following the sudden death of its leader, Seth Cotis. For its utilization of a unique umbrella structure that provides overarching foundation and IT support to its several clubs (fleets) to create a uniform gaming environment. Ajje Game's individual clubs elect their own leaders and are responsible for the bulk of decision making, creating a diverse club responsive to its members. For exemplary service to the simming community. Jon Shuni is a mentor to numerous leaders, spends countless hours running his club, and provides free webspace and other support to sim clubs through Diaspora Games. For his service to the Simming League. Over five years, Twister served as a Justice and Magistrate of the Simming League, helping to resolve numerous disputes and promote peace and understanding within the League. His honesty and integrity is above reproach, gaining the respect of all who come into contact with him. For it's invaluable archive. The Starfleet Library contains a treasure trove of documents from one of the longest running sim clubs, including records that illuminate the earliest days of simming. For its website. The site is full of rich graphics and useful information, presented in a well organized and streamlined fashion, facilitating easy navigation. For The Sim Group Papers. The Papers are a series of insightful, easy to read essays that confront the basic issues of simming, question the fundamental strategies employed by simming leaders, and proposes new methods to improve our game. For it's work to connect the larger community. The DragonMuse Network works to ensure online role-playing is viewed as a community and not a competition among groups. To this end, the network promotes peace, cooperation, and communication and has brought together a collection of online role-playing groups who share resources and follow a basic set of guiding rules, greatly enhancing their gaming environment. For exemplifying the best of the simming community by offering free webservers, support, and other IT features to sim clubs. For its pragmatic management style - where the club selects an 'elected dictator' every 8 months. This system has served the club well. As a result, Starfleet - founded in 1991 as one of the first sim clubs - has also become one of the longest running clubs ever. For their website. The site, its content, and graphics combine to make a simming experience that recreates Starfleet and brings together a series of sims and groups. For My Simming Memoirs. Providing remarkable insight into the evolution of simming and the inner workings of a sim club, Chas' memoirs follow his career from a wide-eyed simmer on Prodigy, to a revolutionary leader, to the downfall of his club, which he analyzes with great candor. For his service to the Simming League as Chief Justice of the Simming League. As Chief Justice, Joe has managed the Court with a steady hand, resolving disputes with fairness, and providing a calming influence within the Simming League. For their website. Utilizing a content management system, New Worlds is pioneering the use of new technology in simming, and is able to provide their members with a seamless role playing environment. For his service to the simming community. During his long simming career, Seth has embodied the ideals of the Simming League and worked tirelessly to enhance the simming community. For its unique blended in character/out of character management system that has produced and sustained an intense, high volume fantasy message board RPG for several years. For its role as the newsletter for the Star Trek simming community. The venerable old newsletter of Spacefleet Online, CommLink and its dedicated staff have recast themselves and now provide an invaluable service as an independent source for simming news and information. For its skilled use of technology, human resources, and an efficient quasi business/quasi government model unmatched in simming community that has allowed the FSF leadership and staff to build one of the best sim groups of all time. For the Xiang Monthly newsletter. This hilarious newsletter seamlessly blends serious simming news and information with hilarious spoof articles, comics, and real life social commentary. The product of a gifted mind, Xiang Monthly is a delight to read. For saving the Simming League. In August of 2001, the Simming League threatened to rip itself apart. Erik Nighthawk, President of the Sim Senate at the time, and facing major internal problems in his own sim club, threw himself into the situation in the League. He was able to save the League, but it cost him his own club. Zappy followed as the next Sim Senate President, continuing Nighthawk's work and overseeing the development of a new constitution which put the League back on track. For his novel Star Trek: Portal of Eternity, posted to the FSF message boards, which is based on his simming character of five years. This wonderful work is an enjoyable read, reveals a great writing talent, and highlights the immense creative possibilities of simming. For allowing the private simming community on America Online to exist and thrive. The Non Affilated Gaming Forum (NAGF) aka the Diaspora Forum on America Online (AOL) and its staff over the years have worked to underpin the private simming community on AOL. Without them and their hard work, most of the simming community on AOL would not have existed. For providing news, information, and services to the simming community. For its unique management system that employs a hands off government whose main duty to develop a club wide community and gives most authority to the sim hosts. This system has allowed the SLA to quickly become a model of efficiency and skillful leadership. For its Weekly Buzz newsletter. Thorough and informative, the FSF Writing Guild works hard to achieve the remarkable feat of publishing a newsletter each week that keeps the vast FSF community informed on going ons in the group. For his long and distinguished simming career. Admiral Sorenson has labored behind the scenes to promote peace, cooperation and stability in the simming world. Many times he was called upon to serve as an independent arbiter to diffuse tense situations, and he was instrumental in establishing the Simming League. For their community governance, which puts the needs of its members front and center. Always living up to the clubs name, the government of Member Focused Simulations (MFS) has proven remarkably versatile, managing to survive transfers of power from one leader to the next. For their website. The beautifully designed website of the Starfleet Legacy Alliance (SLA) is easy to navigate and provides easy access to tons of information. For organizing the 2001 War Games Competition. This friendly competition between clubs allowed simmers to show off their skills and win bragging rights for having the best sim. For their website. Through their new Starbase 254 web site, the FSF has provided a base for their online community that's filled with information and advanced webtools. Additionally, via Starbase 254, the FSF is working to help other clubs by providing server space and support. For its experiments with simming governance. Employing a business organizational model, the ISC has built a strong, united club that provides its members with a high level of service and efficiency. For the Tournament of Simulations. Primarily ran and organized by ISO Troi, with support from RolePlayerUSA.com and the Simming League, ToS brought together many sim clubs in friendly competition and helped to continue the traditions of Sci World and the Simming League. For her TOL Park comic strip. A hilarious spoof of Trek Online, TOL Park has delighted countless simmers from TOL and other clubs. For the TOL Times. Trek Online is dedicated to the belief that in order to have good sims, there must be good information, and the Trek Online Times -- which is filled with club news, information, and comedy -- reflects that belief. For its excellent website with integrated irc chat rooms and mud servers. The site is beautifully designed and organized, and filled with tons of info about the ASG. For organizing and running the 1999 SciWorld Online Convention, the first large scale, privately run online simming convention. After years of struggle and conflict in the simming world, SciWorld showed that sim clubs can peacefully cooperate, have fun, and, in the process, help their own club. For providing independent news, information, and ratings so that simmers can find a club that best suits their desires. For its excellent independent online reporting and Star Trek reviews. For its pioneering republican government and constitution. Involving the members in the affairs of the club while maintaining efficient operations, and led by knowledgeable, friendly leadership, TOLs government has contributed greatly to the club's creative community and high quality sims.